GIW Industries Inc. News Release — View the online version here. The RAMSL provides a faster, safer, more cost-effective way to adjust suction liners. 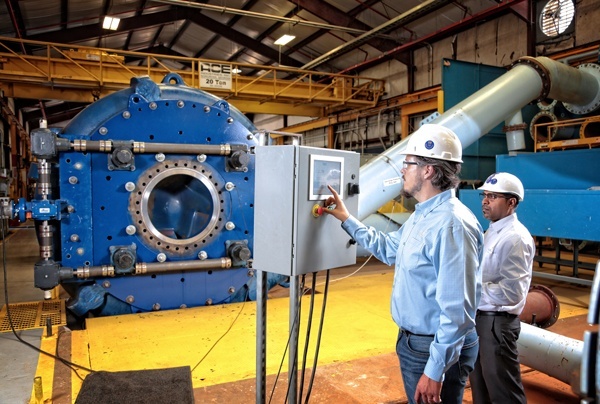 GROVETOWN, GA. (Oct. 9, 2018) — GIW Industries Inc., leader in the design, manufacture, and application of heavy-duty centrifugal slurry pumps, recently announced the Remotely Adjusted Mechanical Suction Liner (RAMSL) product enhancement for the GIW® Minerals MDX Pump. The RAMSL is the next phase of a continuous improvement plan between GIW and Escondida, the largest copper mine in the world. Escondida currently operates eight MDX-750 pumps in their cyclone feed lines. This revolutionary upgrade allows maintenance personnel to adjust their pump suction liners in less time and with less human power than ever before. What once took 32 work hours per week now takes a single worker just a few minutes with the simple push of a button. The MDX-750 is designed to be in continuous use over five months or a total of 4,000 hours. Efficient pump operation in this aggressive wear application is only possible through precise weekly maintenance. One of the key maintenance procedures is adjusting internal clearance between the pump impeller nose gap and the suction liner. Historically, these adjustments were made using hand tools near the rotating equipment. While these adjustments are safe, Escondida was dedicating up to four maintenance work hours per pump per week — and with eight MDX-750 pumps in operation, that time was adding up. To make the process even safer and more efficient, GIW’s R&D team developed a remotely adjustable system. The RAMSL technology allows the operator to mechanically control suction liner adjustment with a control module. "The two primary benefits RAMSL brings are increased safety and ease of maintenance," said GIW Senior Engineer Leo Perry. "Both benefits stem from the ability to adjust the equipment against roughly 400,000 pounds of force from a safe distance without exerting more effort than it takes to press a button on a touchscreen." The RAMSL user interface serves as both the control panel for unit operation as well as an output source for critical data taken from the pump. With this new technology, Escondida is able to track real-time vibration readings and precise suction liner movements to within 0.01 of a millimeter. This allows mine operators to take a closer look at their pumps without the cost-prohibitive demands of a large crew or an unnecessary shutdown. GIW installed the first RAMSL prototype on Escondida’s MDX-750 pumps this spring. They are actively monitoring the program to quantify results, and the preliminary feedback is impressive. The customer is seeing reduced maintenance time and the ability to fine-tune maintenance intervals with minimal interruption. Escondida has requested additional pumps to be outfitted with RAMSL enhancements this year. Although RAMSL was developed with this specific customer in mind, GIW knows it's a product that will revolutionize the mining industry. That’s why GIW is looking forward to bringing it to market — and continuing to enhance its capabilities for years to come. MDX Project Manager Diwakar Aduri is particularly excited about RAMSL’s future. "As technology improves, we want to make RAMSL part of the Internet of Things so it can report back to KSB and GIW to be monitored,” Mr. Aduri said. “We'll be able to see how many millimeters a liner has been adjusted and how often, and then provide predictive maintenance requirements with recommendations." RAMSL is another example of GIW’s long-term commitment to customer satisfaction and industry leadership. "This is a pretty big step for a major pump manufacturer in hydrotransport," Mr. Aduri says. "We’re quickly realizing its potential." GIW Industries Inc. was established as a small, privately owned foundry and machine shop in 1891. By 1914, the company was supplying slurry pumps to the Florida phosphate industry. 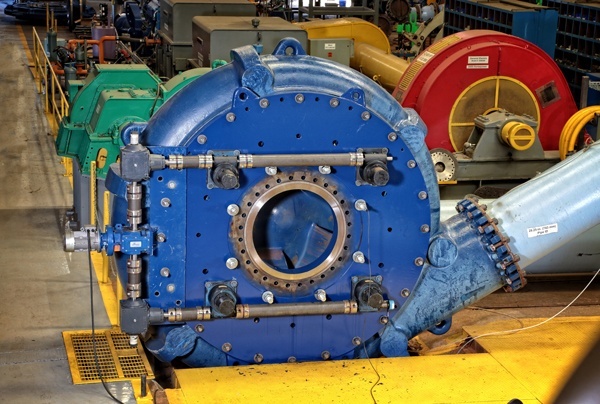 Over the years, GIW became known for its severe abrasive handling pumps and began a century of facility expansion and technology growth. In 1996, GIW became a full subsidiary of KSB, and in 2014, the GIW® Minerals brand was established. Through the GIW® Minerals product brand, KSB strives to be an innovative partner that provides you with the best and longest-wearing slurry solutions. At GIW, your success is our priority. You received this email because you are subscribed to Marketing Information from KSB, Inc. - 4415 Sarellen Rd. Virginia 23231--. Data Privacy. Update your email preferences to choose the types of emails you receive.